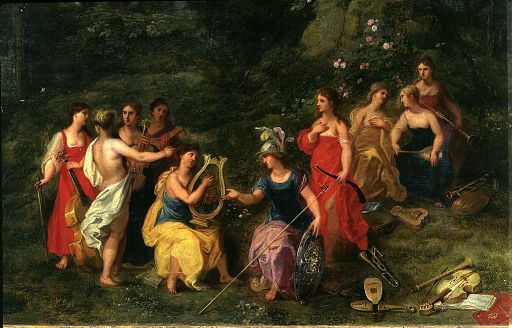 The 9 Muses for international artists and writers – which one is yours? As modern, global writers and artists, we all have those wonderful days when we feel we are just holding the pen or brush while another “being” does the creative work and sends up firebolts of ideas into the imagination. The original 9 Muses of Greek Mythology were a group of sister goddesses who inspired artists and philosophers to create artistic masterpieces. Ancient writers such as Homer appealed to the Muses for help and inspiration, and as Homer’s Iliad and Odyssey are still in print nearly 3000 years later, it’s probably fair to say these appeals to the sibling deities worked. Nevertheless, even with his divine assistance, Homer probably had plenty of bad writing days, just as we have days when the Muse is elusive, and everything we create is no better than our third-grade efforts many years ago. On days like those, it’s wise to remember that times and fashions have changed since Ancient Greece, and perhaps the reason the Muses don’t come is because we don’t recognise them in their present forms. Unless you’re trying to write at a toga party, they probably won’t look like they do in the painting above. They come in all shapes and sizes. So, to assist you in finding inspiration when the creative rivers run dry — meet the new generation of global Muses. Descendant of: Calliope; Muse of epic poetry; emblem – a writing tablet. Modern Muse’s emblem: An iPad. Sometimes disguised as: The female in the cafe who, when she sees you scribbling in your trusty Moleskin, wants to know what you’re writing and says that she could write a novel if only she had the time. If she doesn’t have the time but is so full of ideas that she has to tell strangers about them, her brain is ripe for shameless picking. Descendant of: Urania; Muse of Astronomy; emblem – globe and compass. Modern Muse’s emblem: Sirius can’t map-read to save her life, let alone navigate by the stars, so she goes for a more up-to-date look with a GPS box. Sometimes disguised as: That woman you’ve passed three times while you’re lost and driving around a new city. The woman your male companion won’t stop to ask directions because a) he doesn’t like asking for directions and b) this person looks a bit odd. The odder she looks, the more likely she is to be a Muse, and will end up as an anecdote or character in your next book. Don’t place too much faith in her directions, though. Descendant of: Euterpe; Muse of music or flutes; emblem – a flute. Modern Muse’s emblem: A set of earbuds. Descendant of: Erato; Muse of lyric and love poetry: emblem – a lyre. Modern Muse’s emblem: A guitar pick. Slammia: Muse of modern poetry. Descendant of: Polyhymnia; Muse of sacred poetry; emblem – a veil. Sometimes disguised as: The only good entrant in a pub poetry slam. Descendant of: Melpomene; Muse of tragedy; emblem – a tragic mask. Modern Muse’s emblem: A bottle of Prozac. Sometimes disguised as: That person you get stuck next to on the train, who insists on telling you her life story which sounds like the outline for a bad country song. (See “Fenderene” and “Empithria”) Take notes, if you can. Sometimes disguised as: Your granny when she’s talking about her childhood. Descendant of: Thalia; Muse of comedy; emblem – a comic mask. Modern Muse’s emblem: A large snake called Monty. Sometimes disguised as: Like love, comedy is all around you. Just keep listening for those throwaway one-liners. Descendant of: Terpsichore; Muse of dancing; emblem – dancing, holding a lyre. Modern Muse’s emblem: A pair of satin, worn out ballet shoes. I’m surprised you could sort out Slammia from the others. For me, the 9 Muses blend together to the point where I can’t tell them apart. They seem like different faces of the same person. Or maybe that’s just me — I’m in need of as much inspiration as I can get! 🙂 So, Kate, I’ll take them all!